Google Play Developer Console enables developers to easily publish and distribute their applications directly to users of Android-compatible phones. Recently someone posted on Reddit that a developer is trying to spread malware by masquerading infected programs as legitimate software. 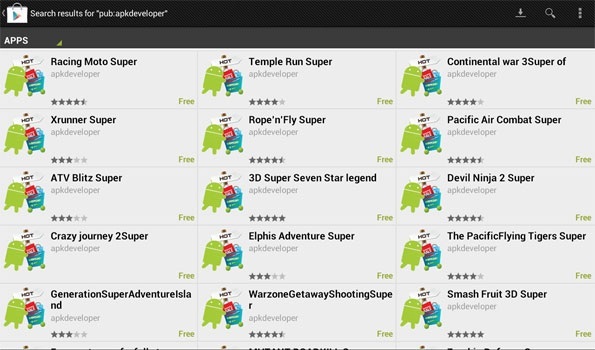 The account of the developer called, “apkdeveloper” and readers spotted that they are posting fake malware apps by names of famous android games and apps, using the word "Super" as suffix to them, making them seem as an upgraded version of the game. The users can find the difference between the real app and malicious app by observing the device permissions, like as compared to the simple permissions like network access and read write access of the original Temple Run app, the ‘Temple Run Super’ app asks for sensitive information like location, phone status, identity and access to user accounts. After many report abuse Google Play has removed the developer from the store page with all apps. Android smartphones and tablets, and device users are being cautioned to make efforts to protect themselves against it in the 2013. Last week we also reported about another malware that is capable of attacks that involve execution of Distributed Denial of Service (DDoS).